The Food Marketing Institute (FMI) introduced its 2019 exploration into the views of produce shoppers and their influence on the 60 billion dollars grocery category. The Power of Produce analysis demonstrates that produce is a big, profitable focus for food retailers, but cautions that the produce purchase is losing momentum to other channels, and younger shoppers are catalysts for this shift. Where are consumers shopping for produce? Fifty-five percent of grocery trips contain fresh produce, and half of all shoppers identified a full-service supermarket as their primary outlet when buying fresh produce. While traditional grocery maintains a dominant lead in sales, a younger generation shows a greater propensity for supercenters and alternative channels, including online, dollar stores, convenience stores and farmers’ markets. In fact, only 34 percent of older Millennials identified a supermarket as their primary grocery store for produce. Fifty-three percent of survey respondents want expanded local assortment. However, the very definition of local has a wide range, with the average response being an 88-mile radius, so retailers will need to develop their own consistent and store-wide definition of local. Value-added produce – cut, chopped, halved, hearts, microwave-ready or even snack packs – delivers myriad solutions for time starved customers. In fact, shoppers could be prompted to buy value-added produce under certain conditions, such as competitive pricing (59 percent) and longer shelf life (35 percent). This year’s analysis notes there’s room for growth in consumption occasions, since 36 percent of shoppers eat fresh produce about three times a week or less, and they’re interested in incorporating produce into different meal occasions. Most notably, 56 percent of shoppers report purchasing veggie shakes or fruit smoothies and 53 percent purchase cold press juices. A more premium basket with value-added, locally sourced and organic products will meet the needs of the consumer and influence the bottom line. 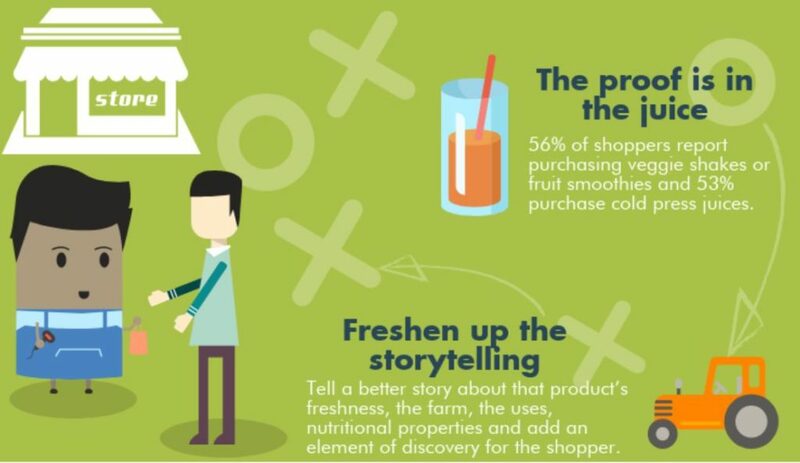 Take a nod from the competition and tell a better story about that product’s freshness, the farm, the uses, nutritional properties and add an element of discovery for the shopper.